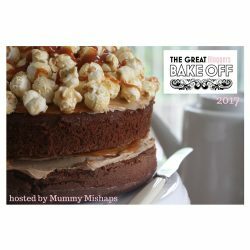 Who has been watching Great British Bake Off this year, now it’s moved channels? I think I was always going to continue watching it; obviously it was going to be different due to the new panel, but I’m glad they kept the same format. I still love it just as much! Rather than the usual smooth caramel centre and milk chocolate topping, I thought I would give it a little twist. So I added peanuts to the caramel and used white & dark chocolate for the topping. The dark chocolate makes it feel just a little more decadent and the peanuts give a bit of added crunch. Preheat oven to 180c/350f/gas 4, and line a deep sided baking tray with grease proof paper. Cream together the butter & sugar until light & fluffy. Fold in the flour until well combined and turning into a smooth dough. Turn the dough into the baking tray, press flat and smooth down. Bake for around 25 minutes or until golden on top, and then leave to cool in the tin. While the shortbread is cooling, put the peanuts in a large seal-able food bag and bash with a rolling-pin until roughly crushed. Sprinkle the peanuts evenly on the shortbread. Put the cream, butter, and sugar in a saucepan and heat gently, stirring often until the butter has melted and sugar has dissolved. Bring the mixture to the boil and let it simmer for 3 or 4 minutes until it’s started to thicken. Add sea salt to taste. Carefully pour on top of the peanuts and gently tilt the baking tray to evenly spread the caramel. (You may need to spread it to the edges with the back of a spoon). Break the white chocolate into one bowl, and the dark chocolate into another. Carefully melt the chocolate in the microwave in 30 second bursts, stirring well after each burst. Once the caramel has set, remove from the fridge and pour the white chocolate over the top. Pour the dark chocolate onto the middle of the white chocolate and spread roughly with a spoon. Make some pretty patterns too! Put back in the fridge for the chocolate to set. Once set, remove and cut into pieces; 8 to 16, depending on how big or small you want them! If you’re in need of new baking equipment, check out Cook the Stone’s reviews! lovely combination of ingredients, and loving that you have a double layer of chocolate on the top! They will be so yummy…but I can’t make it. Right up my alley. Love peanut butter and especially your recipe.